It is my hope that you have just finished reading my article in this issue on the history and background of Death Valley National Park. 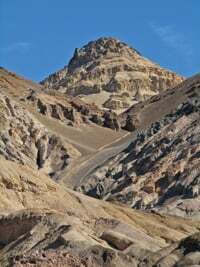 Knowing how active you RVers are, you are probably clamoring to read about the fun stuff you can do and the places in Death Valley you can visit. OK, knock yourselves out! Artist’s Drive, a nine-mile, one-way loop drive, swoops through magnificent washes and mud hills and leads to Artist’s Palette, which has its own charm and beauty with a variety of geologic formations offering aqua, pink and purple colors. The road is restricted to vehicles under 25 feet. Again, mind the 25-foot vehicle length restriction going up the steep hairpin curves to Dante’s View. At 5,475 feet, it offers a spectacular panorama of the 130-mile-long Panamint Valley. The stretch across the valley between Telescope Peak, which is the highest peak in the Panamint Range, and Badwater, which is the lowest point in the Western Hemisphere, is roughly twice the depth of the Grand Canyon. Telescope Peak tops out at 11,049 feet, and Badwater is 282 feet below sea level. As the crow flies from Dante’s View, it is less than 100 miles to Mt. Whitney, which at 14,49 feet is the highest point in the lower 48 states. It really is good to walk well out onto the vast salt flats of Badwater Basin and roll salt between your fingers. Don’t do it in really hot weather! Far up on the side of the mountain is a sign announcing actual sea level. 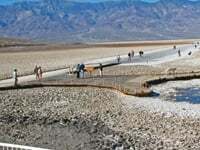 The Playa Racetrack has large rocks that move across a seasonally dry lake bed in the northern part of the Panamint Mountains. With no documentation that proves how they move, it is believed that during heavy rains, the lake bed becomes slippery enough that a stiff wind moves the rocks, leaving tracks behind them whose sole purpose it is to make us curious. Over 3,000 years ago, a massive volcanic explosion caused by the violent release of underground steam pressure created the Ubehebe Crater. After years of cinders and dust settling, we now can look directly into the 600-foot deep crater. On my visit, it was extremely windy but fascinating. Discussion centered on whether the volcano within might still be active. Disregarding those thoughts, hikers found smaller craters as they made their way around the 2,400-foot rim. The sand dunes rising 100 feet above Mesquite Flats were fascinating with the ripples and patterns brought about by the constant shifting of windblown sand particles. The brooding Grapevine Mountains hovered over them all. But wait! Do I see C-3PO and R2-D2? Well, maybe not, but the scene of the two Star Wars droids walking across the dunes was filmed at Mesquite Flats. Nearby is the Devil’s Cornfield, a group of shocks created by clumps of arrowweed that looks every bit like the corn shocks in an Iowa cornfield. The Indians made arrow shafts from the stems. Although it is magnificent at any time of day, sunrise is an especially great time to visit Zabriskie Point and greet the day with a view of Manly Beacon, the prominent pinnacle landmark. Color changes by the minute and you won’t be disappointed. Watch for temporary construction closures this year. Although I had visited the park many times, surprises surfaced frequently during a media tour organized by Mona Mesereau for Furnace Creek Resort and Death Valley National Park. In its continuous efforts to bring new interests for guests, Furnace Creek Resort has formed a partnership with Farabee Jeeps for guided tours. We were the guinea pigs. Four other writers, Mona, and I, climbed into two Jeeps. Our first stop took us briefly into Rhyolite, a Nevada mining town just beyond the park borders. This settlement was brought to life in 1905 when quartz was found in abundance and described as “just full of free gold.” As boomtowns did, it grew into an active community. A few buildings still fight to stand upright as the wind blows through, remnants of their exciting glory days By 1916, the lights and power were shut down and the nights became silent once more. Only the blowing wind and the stars remain. Our one-way, 26-mile Titus Canyon tour was not disappointing. The Jeep sunroof provided spectacular views. The gravel road twisted in and around and up into the mountains like a drunken snake. The driver stopped at Red Pass, and we marveled at what lay ahead. We investigated the ghost town of Leadfield. History reveals this boomtown was founded on wild and distorted advertising. Less successful than Rhyolite, it was even more vulnerable to the passage of time. Leadfield’s rusted shacks and a few tailings are evidence that it existed once upon a mountain from 1926 thru 1927. We advanced into the canyon narrows. Escape wouldn’t be possible in a major rainstorm, as sadly experienced by a young mining engineer for whom the canyon was named, and where he lost his life in a flash flood. Our driver admirably maneuvered the Jeep through the canyon, stopping whenever we couldn’t restrain our cameras. Little is known about the petroglyphs so I interpreted them to my own satisfaction. Steep walls, 20 to 70 feet apart, rose precariously upward as we wiggled through them. What a fun run, and I saw my only wild animal for the trip, a coyote. Over 22,000 years ago, the enormous body of water now named Lake Manly dried up. That lake bed experienced extreme flooding in 2004 and water covered 100 square miles to a depth of approximately two feet at its deepest point. This allowed the first ever canoeing across the lake by tourists and park rangers. Alas, the water evaporated once more and the lake bed returned to a mud-salt mixture. Rangers schedule special walks on moonlit nights to experience the wonders of Death Valley with nocturnal wildlife tales and lunar myths. Telescopes provide details of the moon’s surface. A paleontology tour is limited to 15 hardy hikers on selected dates only. A park ranger leads this wilderness hike for a closeup encounter with fossilized tracks of bird, horse, camel, and mastodon-like creatures. Special tours of Scotty’s Castle focus on the basement, underground tunnels, and everything that was used for comfortable desert living in the 1930s. The Lower Vine Hiking Tour takes you to Scotty’s actual home, a modest cabin about two miles from the castle. The park service lists 16 biking trails. The visitor center has current information and maps. Bikes are not allowed on cross-country or hiking trails but can use the hundreds of dirt and paved roads. We’ll end this series next month with “The Tales of Death Valley National Park.” God Bless. Sharlene Minshall’s first e-book novel, Winter in the Wilderness, is available at most Internet book sites. A print edition may be obtained from Amazon.com or you can order an autographed copy from the author at Box 1040, Congress, AZ 85332, for $7.95 plus $3.50 for postage and handling. The fourth edition of RVing Alaska and Canada is available at amazon.com. Follow Sharlene?s blog, The Silver Gypsy, at rvlife.com.